Friction / Friction definition: If we either slide or attempt to slide a body over the surface of another body, electromagnetic forces act between the charged particles at the surfaces of the bodies which makes each body to exert a contact force on the other. The magnitudes of the contact forces acting on the 2 bodies are equal and opposite following Newton’s third law. As we resolve a contact force acting on a particular body into two components we find the the parallel component of the contact force to be resistive to the motion. This resistive force is called friction or frictional force. In other words, if we either slide or attempt to slide a body over a surface, the motion is resisted by a bonding(cold-weld) between the body and the surface.The resistance is considered to be a force called either the frictional force or simply friction. This force is directed along the surface, opposite to the direction of the intended motion. 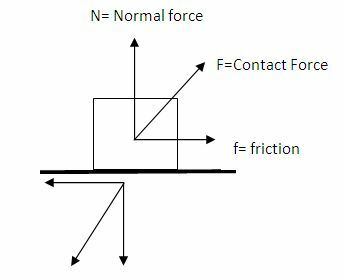 Friction caused by contact forces – how? The following diagram will help us to understand how contact forces between two surfaces give birth to friction. See, there is a block on a surface. If we intend to move the block towards left from right, then the block will exert a downward push on the surface which makes an angle with surface. Now the surface will also apply an equal and opposite force on the block. We have shown the reaction force as F (contact force in the diagram). Now if we resolve F along the vertical and horizontal direction, then we find the horizontal component to act opposite to the direction of the intended motion of the block. So obviously this force is resistive to the intended motion of the block and hence we call it Friction or Frictional force. Now as the block tends to move here from right to left, the surface below again tends to have a relative motion from left to right. So will that relative motion will also face a resistive friction? Now again we can resolve the downward force exerted on the surface by the block. After resolving we see that, the horizontally resolved component is directing towards left. This is opposite to the tentative relative motion of the surface. So this is again a frictional force. But this time it acts on the surface below to resist its relative motion.